Alright y'all, I know you're bummed that you didn't get to see NIN's ACL TV appearance tonight but that doesn't mean you can't rock 'n roll. 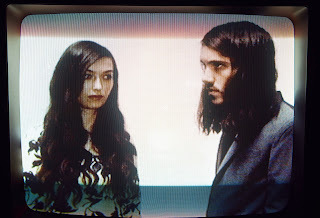 Tickets to see Cults at Emo's tonight are still available. I had never heard a song by Cults the first time I saw them and they blew me away. Their music is much lighter and more fun than their name might imply with vocals that evoke Leslie Gore. The first single from their latest album, Static, is one of my favorite songs of the year and the record really delivers on the whole as well. Cults are headlining but the bill for tonight's show at Emo's is a stellar indie line-up from top to bottom with Mood Rings opening and SACCO middling. To be honest, I have never heard of this band SACCO so I think it's really smart to have them play in the middle because Mood Rings are great so people will arrive early and they're obviously going to stay for the headliners. So having SACCO play the middle set will give them more exposure than if they were opening. However, for all I know all of you are really big fans of SACCO and you have never heard of Mood Rings I sort of live in a bubble that way. If Cults aren't really your thing, you might be interested to know that NoBunny is also in town tonight. You can catch them over at Red 7 this evening. Find out what other note-worthy shows are hitting Austin this month. That show is only $12 and it will take place on the inside stage.